This pretty little village, with wonderful walking and a charming atmosphere, enjoys a truly picture-postcard setting at the foot of the Bischofsmütze and Dachstein Mountain peaks, surrounded by unspoilt scenery. Bischofsmütze means ‘Bishop’s hat’, and is so called after the striking shape of the peaks which form the backdrop to the village. Acres of pine forests, mountain streams and lush pastures surround the cluster of houses around the village green which plays host to regular open-air concerts and festivals throughout the summer. There are many walking paths starting from the village, and the walkers’ ‘wanderbus’ network transports you to mountain alms and the start and end points of various trails around the valley. Ideal for nature lovers who want to experience true Austria – the locals describe it as a little piece of heaven. Geocaching is a treasure hunting game where you use GPS to hide and seek treasures. Taster (1½ hrs), Wednesday, approx. €10 or guided Hike (4 hrs), Fridays, approx. €25. Both are bookable locally. This lovely hotel is a favourite amongst Inghams guests who return annually for the warm welcome and high standards provided by the Ebner family. 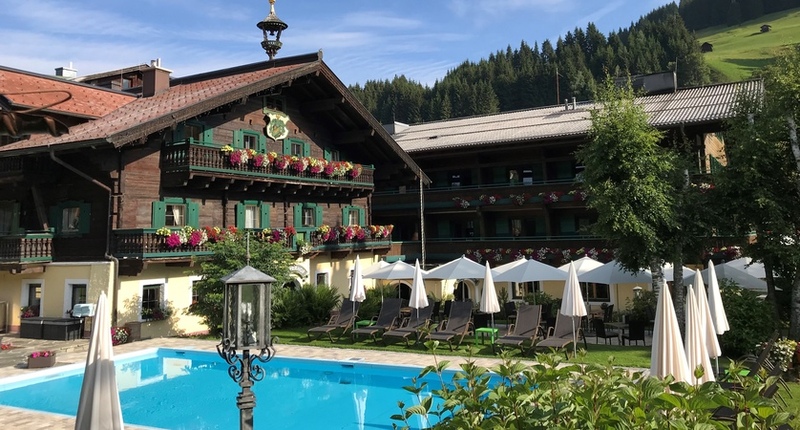 The charming Hotel Alpenkrone combines ‘country house’ character, including a 19th century drawing room with family antiques, with modern features such as a superb leisure area. Located in the heart of Filzmoos, opposite the pretty village square, the Hanneshof has a reputation for good, friendly service and cuisine. This lovely, traditional hotel oozes history and character and offers cuisine and comforts of the highest standard. Excursions to Dachstein, Hallstatt, Salzburg, Berchtesgaden, and the Liechtenstein Gorge may be available locally. Located in the heart of Salzburgerland, Liechtenstein Gorge is not only the most beautiful but also one of the longest and deepest gorges you can find in Alps. Join us for a half-day and see this wonder of nature with roaring waterfalls, moss covered boulders and rainbows wherever sun touches the fine mist in the air. Travel home over the beautiful Hoch Konig mountains with a refreshment stop in the traditional Austrian village of Maria Alm. Filzmoos comes alive during the summer months (late June to end August) with the village brass band playing regularly in the evenings, and a selection of festivals including the annual Dorf Fest in July, National dress days, doughnut and dumpling festivals plus many others with food stalls, entertainment, live music and dancing in the village square. For more information go to www.filzmoos.at. Filzmoos boasts over 200km of clearly marked walking paths for all levels, with some stunning walks throughout the Bischofsmütze and Dachstein area, particularly around Bachalm, Moosal, Hofalm and Neuberg. The valley is filled with mountain streams, green pastures and pine forest, and the hillsides are dotted with rustic mountain alms for regular refreshment stops. Getting Around The efficient walkers’ ‘Wanderbus’ is a regular shuttle service for walkers to various mountain huts and the start and end points of trails around the valleys, opening up many circular walking routes. Cost approx. €4 per journey or FREE to guests at Hotel Hammerhof and Hotel Hanneshof. The Grossberg chairlift in Filzmoos runs two days a week from end June to mid September, and the Dachstein cable-car in nearby Ramsau runs daily (accessible by Wanderbus). Popular Walks include Filzmoos’ highest peak the Gerzkopf, for 360˚ panoramic views, the circular Alpine Flower walk and a dramatic trail to the snow covered Dachstein Glacier at 3000m (accessible by local bus), as well as extensive scenic marked trails between various mountain alms in the local Bischofsmütze and Dachstein valleys. ‘Filzmoos Activ’ runs an excellent programme of daily guided walks through the tourist office including themed easy walks and longer summit hikes to various points around the valley with professional English-speaking guides. Walks are graded blue, red and black for difficulty/length and there is often a choice of walks each day. A small local charge may be payable. Full information is available from the Tourist Office and your Inghams Rep.
Two Centres | Combine your stay in Filzmoos with 3, 4 or 7 nights in another resort in Austria or Germany. We recommend the delightful lakeside village of Fuschl or the magical city of Salzburg for its wealth of culture and history.